Discussion in 'AR Pattern Rifles' started by MacA, Dec 12, 2017. 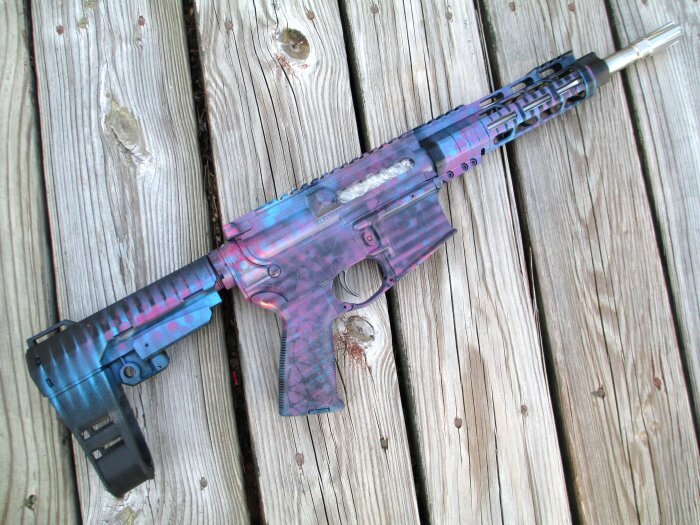 So I’m really late to this thread, but want to build a pistol. 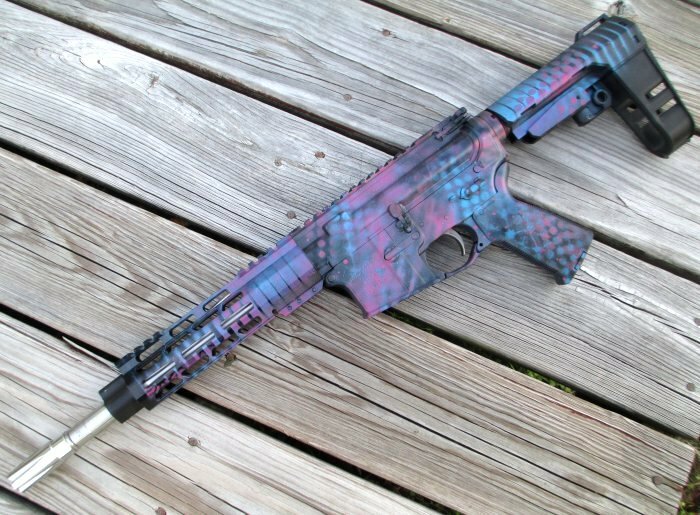 Are there any restrictions on OAL or barrel length for it to be a pistol? Does it require anything special as far as buffer tube or lower? I’ve put together three rifles and was wondering if the only thing that makes it a pistol is intent while putting it together. Just remember a pistol needs to have a receiver that was never a rifle, IE complete rifle. Barrels can be any length up to 20" rifle barrel. Most use 7.5" or 10.5" bbls. No rifle stock on receiver extension. Can have a straight tube or brace. Basically start with a stripped virgin lower and build like you are going to have a SBR but no stock. JRHorne, JustKeepSwimming and ChickenHawk like this. Thanks! I thought that was the case. I like the idea of a 11.5” barrel due to what I’ve read and watched elsewhere where it is supposedly much more reliable. So basically rifle from virgin lower that uses a brace? Should be easy enough. Any suggestions on which brace works best? I’m short which means I’ve got a really short LOP. SBA3 seems to be the most popular and is adjustable (but a little pricey). Since I’m asking for advice, there are two uppers that I’m currently liking. Any opinions between these two options? I really dig the muzzle device on the PSA and how it would be a bit more suppressor friendly if I go that route eventually. On FH, all would be suitable for a suppressor as long as the FH is NOT pinned and weld. As long as you can remove the FH, you can swap with whatever you need to work with the suppressor you purchase. FYI the Palmetto State Armory Fluted Flash Can is only 1.2" OD... you won't find a 5.56 suppressor under 1.375". you won't find a 5.56 suppressor under 1.375". You know what I mean... trying to do the guy a favor. GA Optimus Micro would fit. But I think it has a 12.5” minimum barrel length for 5.56. I won't own another GA product after attempting to deal with their customer service on multiple occasions. What kind of optics are y’all using? I like the idea of a red dot, but my astigmatism bugs me and it makes a giant fuzz ball. Red dot, prism sight, or 1-4x optic? My USPS tracking says that my heavier buffer was delivered today at 3:55. I still haven't found it yet. Have you checked with the neighbors? I know all my neighbors. They would have already brought it to me if they got it. Maybe it's still on the truck and I'll get it tomorrow. Either way, I'll stop by the post office and see what they have to say. Have astigmatism. Went to the prism sights. Loved the Vortex 1x. Excellent sight. More accurate for longer range than a red dot because the center dot is tight and image is very crisp (has diopter). After shooting that awhile I went to LPVO. I now have a 1-4 on my sbr, and a 1-6 on an 18" rifle. I've found with good scope on 1X with illuminated center dot, I can shoot both eyes open just as fast as a dot or prism. With the ability to zoom as well, it is very hard to beat low power variable optics, imo. The market has many options and price points. I always recommend the Steiner Px4i because it's awesome for the money and fairly lightweight. For cheap scope, I also liked the Vortex Crossfire 1-4x24 with illuminated center dot. I've bought better ones since, but that was a good little scope for my use although not very bright illumination. That said, if it was only for concealment (in vehicle for example) and self defense and the goal is tiny/compact and it's only to be used on an OH CRAP type situation, I would just use iron sights because I would expect the engagements to be fairly close. Or a red dot maybe. But I don't have any guns like that. Mine play a more universal role with a focus on competition. Just my opinion! And, you're right near my range if you ever want to try the Steiner. That’d be awesome. I do like the idea of a variable power scope. How is the accuracy on a pistol/sbr under 11”? The mail lady brought it today! ronn47 and JustKeepSwimming like this. 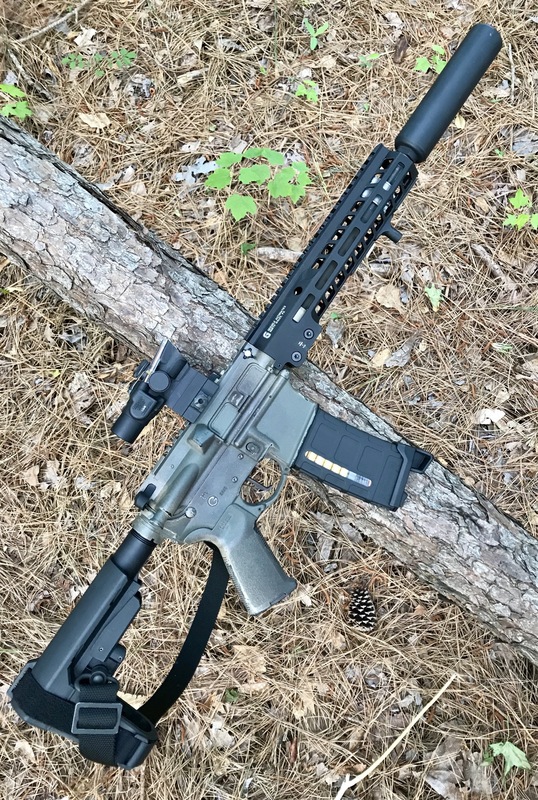 Who makes a good budget handguard/rail. Is there anything out there around $100 that's decent? NKD and JustKeepSwimming like this. Likely depend on quality of components and actual length. 11" quite a bit more juice than 7.5". But accuracy to 250 was never a problem for me with a 7.5". Never shot it further than that. Had two with aero/ba barrels and they shot well. I've gone to 12.5" as a minimum because I usually prefer a 12" hand guard, and do like the extra velocity. Had to find a use for my $35 pistol barrel. JRHorne and bkv like this. JustKeepSwimming, Pbj ak and ronn47 like this.